Spooky land contains a series of fascinating articles on—what I regard to be—fake antique vampire killing kits. For my previous writings on vampire killing kits, see: 'The scoop on vampire killing kits', 'The Blomberg effect' and 'Vampire killing kit update!'. There are many versions of these kits. They're generally supposed to have been made and sold in the 19th century. Some are auctioned off thousands of dollars. Two names commonly associated with them are Ernst Blomberg, a supposed vampire expert, and Nicholas Plomdeur, a Belgian gunsmith. The problem is, there's no credible evidence that kits were manufactured by these gentlemen. Spooky land's 'Regarding Ernst Blomberg', says it is 'becoming increasingly unclear is whether these kits, often commanding tens of thousands of dollars at auction, are instances of actual antiques, or modern assemblies of old parts and fill-ins, intended to deceive the buyer.' I argue that the latter's the case. But first, let's examine the evidence of Blomberg's role in their creation. Firstly, the article establishes the reality of a man named Ernst Blomberg. However, there's some difficulty in establishing which Ernst Blomberg he was. Three candidates are listed, Ernst Diedrich Wilhelm Blomberg, Ernst Ludwig Werner Blomberg, but the author settles on Ernst Freiherr von Blomberg, a 'Professor of Zoology'. 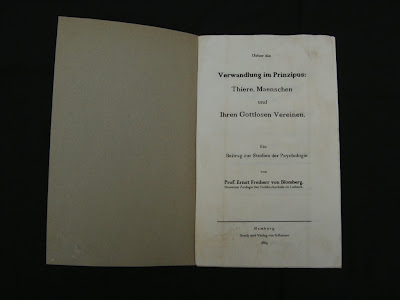 The author was contacted by someone named Meredith, who provided further information on Freiherr von Blomberg, telling him that in the Universität zu Lübeck's library, there 'several courses from one Professor Ernest Freiherr von Blomberg, who was a Professor of Zoology from 1856 until 1903, the year he died'. I checked the catalogue of the University of Lübeck's library—the Zentrale Hochschulbibliothek Lübeck—and found found three records for works under an author search for 'Blomberg'1: none of them were written by an 'Ernst Blomberg'. Meredith went on to say that 'The man seems to have had an obsession with shapeshifters and other creatures alike, for he wrote a rather unreadable book on it, "Die Verwandlung im Prinzipus: Tiere une Maenschen und Ihre Gottlose Vereinen", ed. 1869'. However, a search for the title on global library catalogue, WorldCat, yielded zero results. The link to the Surnateum is telling, as Meredith—a poster on SurvivalArts—is the source of this extra info on Blomberg. The author briefly covers their kit, adding, 'The Surnateum has a lovely website, but the contents should be viewed with a grain (or two) of salt.' Why's that? Let's take a quick detour to the museum. But the pistol has a greater claim to fame. It was apparently used against one of the worst mass murderers of the 20th century: 'After looking at several options, the Collector opted for a young major, an SS Sturmbannführer in the Waffen SS by the name of Otto G., with whom a meeting was organised.' And on to say, 'The right moment presented itself during the afternoon of Monday, 30 April 1945. Shortly after marrying Eva Braun, a depressed Hitler announced that he was going to commit suicide; the excuse was perfect.' You get the drift. As the author notes, Leubusher is sometimes promoted as 'a colleague of Blomberg', which can be seen in his Wikipedia entry. Perhaps unsurprisingly, this 'info' is not found in the German version. It's obvious that Leubusher's connection to Blomberg is an in-joke, a way of 'referencing' the source of the manufactured Blomberg book. Yes, 'standalone', because someone went out of their way to create a page dedicated to the man, as well as providing a picture of him (left) before the Wikipedia editors stepped in. His incorporation into 'Freiherr von Blomberg', itself, is considered 'dubious'. 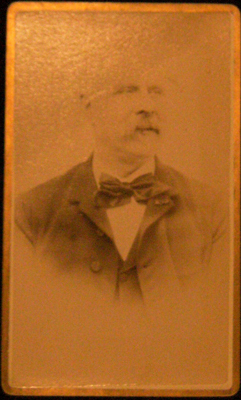 Regarding Nicholas Plomdeur, he, too, was a real person. A gunmaker. But that's as far as the 'evidence' goes. There is nothing to substantiate his role in providing firearms for these kits. All we know is, some kits incorporate his pistols. That's it. If one of these kits came with a pair of Peacemakers, that wouldn't automatically prove Samuel Colt was involved in the vampire killing kit trade. The best evidence we need to determine the authenticity of these kits, is a paper trail. Contemporary references. Something that directly connects them to Blomberg or Plomdeur. Even authenticating their 'age' isn't good enough: the kits are composed of actual antiques, with some artificially aged. The kit housed by Mercer Museum, Doylestown, Pa., is one such example (see 'Vampire killing kit update!'). Considering the price these kits attract, much more effort should go into determining their authenticity. The first true vampire: another candidate? Brother, can you spare a mint?